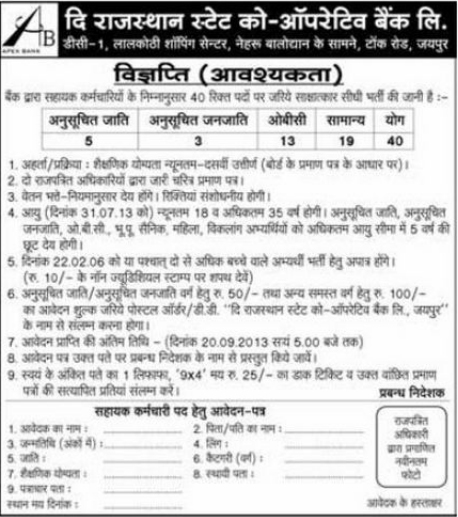 Rajasthan State Co-operative Bank Ltd invites offline applications for the post of assistant. RSCB released the notification for the recruitment of assistants. Bank will update its official website shortly. Here i request you to pls confirm me for the vacancies. Qualification: B.Com graduate from University of Rajasthan in year 2008. Presently working with Genpact since Dec 2008 as process associate and handling my responsibilities in a good manner. Had worked as a CPA executive in ICICI Bank Ltd with a period of 2006-08. Give me tha Rajasthan State Co-operative Bank Recruitment form Please. Please sent to Form. Urgent.